What Are Some Other Names for Jesus in the Bible? As Christians we do not question the fact that Jesus existed. Likewise, there are many historical references outside of the Bible that mention Jesus and His followers. However, many Non-Christians also believe He existed, but their belief is based on popular belief, not the Bible. Unfortunately, popular beliefs do not fully express Who and what Jesus was. Therefore, if you look at both the position and person of Jesus, you will find other names that He was called by. A short study will reveal what are some other names for Jesus found in the Bible. What do we know about the name Jesus? What are some other names that refer to Jesus? This reference to Jesus is first found in the Old Testament, in a prophecy of His birth to a virgin (Isaiah 7:14, Isaiah 8:8). In the New Testament, this reference is seen as a quote of Isaiah 7:14 along with using the word Emmanuel, which is interpreted from Hebrew to mean God with us (Matthew 1:23). 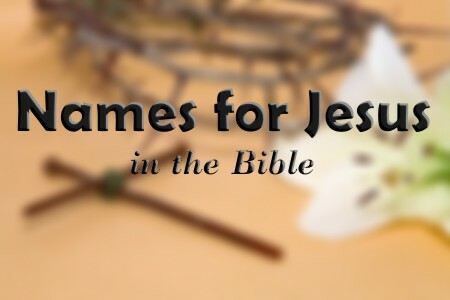 Many people think that Jesus Christ is the full name of Jesus. However, as we will learn in a moment, the name Christ is not part of His personal name, it is His official title. As mentioned above, Christ is the official title of Jesus (John 1:41, John 4:25; Matthew 16:16). The title Christ is the New Testament equivalent of the Old Testament word Messiah, which means the “anointed one” (Daniel 9:25-26). As the Christ, Jesus holds three offices: Prophet (Isaiah 61:1; Luke 4:16-21, Luke 24:19); Priest (Exodus 29:1-7; Hebrews 4:14-5:10); and King (Psalms 89:18, 95:3; 1 Timothy 6:13-16; Revelation 19:11-16). Combined, these three offices encompass three different aspects of His existence as the Christ. The name, Son of God, emphasizes Jesus’ deity with God as His Father. The first reference to Jesus as the Son of God is found in Daniel 3:24-25 when King Nebuchadnezzar noticed another person in a furnace along with three men he had cast into the furnace. These men, Shadrach, Meshach, and Abednego, servants of the most-high God, had been cast into the fire for refusing to bow down and worship the gods of the king. 6. When Caiaphas, the High Priest, asked Jesus if He was the Son of God during His trial (Matthew 26:57-68; Luke 22:70-71). Note: This reference is a direct confession of Jesus being the Son of God as evidenced by the fact that Caiaphas tore his clothing when he heard the answer. The title “Son of Man” occurs 196 times in the Bible. However, not all references to the son of man refer to Jesus. When Caiaphas asked Jesus if He was the Son of God, Jesus made a reference to himself as the son of man, who would sit on the throne in heaven and return to earth (as the Son of God). Using the Son of Man in this context, Jesus emphasized His humanity combined with His divinity. Jesus was the only person to use the title, Son of Man, in the Gospels with the exception of an instance when the people asked Him a question about who was the Son of Man that would be lifted up (John 12:34). The use of the term God to describe Jesus emphasizes His divinity (John 20:28; Hebrews 1:8; Titus 2:13). We also learn that Jesus, as the Word, was in the beginning with God, and He was God (John 1:1, 14; 1 John 5:7). There are numerous other references that confirm the divinity of Jesus both directly and indirectly (Zechariah 12:10; John 19:37). The use of the word Lord, is a title that emphasizes Jesus’ position in ruling over us (John 20:28; Acts 9:4-5). The Bible teaches us that in order for us to confess that He is our Lord, we must first be saved so that we have the Holy Spirit in us to empower us to do so (1 Corinthians 12:3). The use of the term Nazarene is a reference to the childhood home of Jesus as being the town of Nazareth (Matthew 2:23). Often, people confuse this with being a Nazarite. A Nazarite was a person who took a special holy vow (Numbers 6). This vow forbade them from consuming vine foods, vinegar, cutting their hair, or coming in contact with dead bodies. Jesus did all of these during His lifetime (John 19:28; Matthew 26:29), raised the dead several times, and did not have long hair (1 Corinthians 11:14). The word Nazarene also shares the same root in Hebrew as the word “branch” (Netser) as seen in Isaiah 11:1, which refers to Jesus as a descendant of Jesse, the father of David (1 Samuel 16:1). There are literally dozens of other names for Jesus that can be found in Scripture. However, the most important thing to remember is that there is no other name given under heaven whereby we can be saved. This name, Jesus, is the only name that should cause every knee to bow and every tongue to confess that He is Lord (Acts 4:5-14; Philippians 2:5-11). If you look at both the position and person of Jesus, you will find other names that He was called by. It is clear to see that there are many other names referring to Jesus as a person, as God, and the Christ. However, the most important thing to remember is that there is no other name given under heaven, Jesus, whereby we can be saved. Take a look at this related article: How Was Jesus Described in the Old Testament?